← How are they finding you? I’ll talk about women first. Today I watched the semi-finals of World Cup soccer from Germany. The US team prevailed over France in a very exciting game before a huge crowd, and they move onto the Championship on Sunday. Now soccer is not Roller Derby, but the play, the discipline and the flow of the game were very exciting, although only 4 goals in total were scored (do I have to tell you who got 3?). There is little doubt that Roller Derby is on the verge of what most of you have been hoping for: a fully competitive popular sport. Women’s basketball and soccer and softball are all accepted, and I and many others think Roller Derby is more exciting. So what is my point? I would hope that rules committees look at ways to make the game more exciting from a spectator point of view: less penalties (not ones that should be called, but stop impeding the game), and ways to keep the action moving forward. 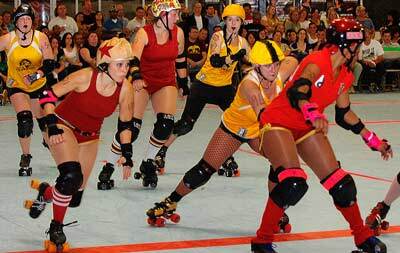 The disparity in the scores could be solved in several ways: teams only play other teams that are of the same ability; shorten the jam time; make certain there is one jammer from each team at the start of the jam; only permit two players in the penalty box at one time; allow the pivot to chase the jammer if her jammer can not get out of the pack, and start the jammers from the rear of the pack, requiring the pack to be moving or be penalized. Please shorten half time to 15 minutes (easy if you get rid of minor penalties). And the score should be given to the audience and announcers at the end of the jam, not during. Photo by Ron Horton. Angel City Derby Girls (red) vs. Salt Lake City Shakers. OK, I keep hammering at the same point, but blowouts and stoppages are bad for spectators, if that is what you are concerned with. I understand that OSDA, MADE, and perhaps Renegades skate a similar game. I think that the flat track leagues that do not figure ways to solve this problem they might be left behind in the future….just my opinion. Of course, a number of people do not care about expansion and that is fine. Now men: there really should not be any dispute this. Yes, the women revived and recreated the game. But it was always designed for both men and women. I really am not for having men and women compete on the same teams against each other, but apparently that is what MADE is doing. I have watched some of the men’s games, both banked track and flat, and at present the teams are behind the women in skill and strategy, but that will change rapidly. To me a perfect evening would be a double header of a men’s game (two twenty-minute periods) and a women’s game to follow (same period time). I think that would have great audience appeal and bring the best there is in our game. Photo by Sharkey. (masonite.burn@gmail.com) Portland Men's Roller Derby. And can’t there be a way that more teams could play each other, even if not in the same rule settings. It would help all leagues and allow the teams to be able to skate more games during the year. No one has to listen to me. Am I just one voice in the wilderness? Subscribe free to my posts, enter your email address at subscriptions at top right hand of this page. I know quite a few women who loves to skate with the men, while others won’t. Personally, I like Old School style alternating periods. I am not a fan of the co-ed game with men and women on the track at the same time. In training, that’s one thing, but not in a game. Why must the game be separated? I’m okay with it, if it has to be that way, but I’d rather see cumulative scores with alternating female/male periods. Come on we have been playing co-ed for 6 almost 7 years now. Same track, same game. If you think these ladies can’t clean a guys clock on skates then you don’t know what you’ve been missing. Even our 95 lb Cinna-Ster laid out one of the best male skaters around (Ed McMayhem) in our last game. And now all of your people prefer to play co-ed. Moe – I’ve seen many women take out men. Just in the last banked track game in Philly, in the last period, Tasha and Hottie joined the men and finished the period with them. They both put a few guys on their keesters. Hey, I’ve been around the OSDA now for over 4 seasons and I’ve seen my share of co-ed games. They are not my favorite style of game. I’ve seen it where the guys didn’t hold back and they really injured a couple girls. I’m all for equality of the sexes, but I’d rather see Derby skated in an Old-School style with alternating men and women. Just MY preference. You know I support you, whatever you do! Joe, my feeling is the men can have separate league standings. I would like for the rules to go back to the Derby of the 50s where the men skated a period and the women skated a period. The old rules rule!! Bring back the good ‘ole Derby as I remember it! I like the idea of the two games continuing to be different, however double headers would be a cool idea. Especially if it helps bring in the crowd. I like the idea of WFTDA and MRDA running their league. However if the WFTDA does not move quicker in enacting/fixing rules to improve game play, if they do not really start to look at making more competitive leagues (maybe a D1, D2, D3 style) then in a few years they will become irrelevant. Our sport, the modern version, only has a few years of the infancy stage left. After that it becomes another league/sport that will come and go, anybody remember Women’s Pro Volleyball or Roller Hockey International as two specific league examples. Personally I do not see why it is bad to update the score during the jam. Seems like it would be more legit if they updated the score when the NSO’s received it from the jam ref. Randy, lots of leagues do update scores during the jam. Not only do leagues do per-pass scoring, it is in the WFTDA best practices. That means all WFTDA leagues are supposed to be updating the score that way. The best reason for not updating, Randy, is so that the officials (and I assume there will not be the committee in the middle of the track) confer and agree upon the scoring, so that it is not necessary to adjust after the jam which always looks bad to the audience. your love of the game…..I will be there with you. I think right now flat track roller derby has the advantage over banked. The first reason is because the same way Basketball took off in this country and more importantly soccer across the world is because you need less to play the sport. If you barebones it all you need are some skates and some sort of hard surface banked obviously does not have that. I think the second reason is because flat track seems to be more unified with both the men and women basically playing the the WFTDA rule set. Banked track once again seems to have different rule sets. (I realize that there are some other leagues playing other flat track rules, majority play wftda). Ultimately though it is going to be the one that is marketed better to the general public since both sports have their plus/minuses. It does seem like WFTDA is starting to make a move so look out banked track they could shut the door down with some key moves in the next year and a half. Jerry, did you watch the MRDA championships this past October? I think the men ARE at the level of skill of the women and, I’d also venture to say that they are developing different strategies (just as the top women are) but their strategical game is right up there with the most strategical women’s leagues. Any given men’s league in any given area might not be as advanced as their local female counterparts, but the best of the best, at least in North America, aren’t all that far apart if they are at all. Oh, and at Pioneer Valley Roller Derby we’ve been alternating men’s and women’s periods since 2007. We used to play two 20 minute periods each until the men started up MDC (now MRDA) and they went to 30s so we went to 30s. We do lose some of the crowd due to the length of our bouts. this was written six months ago…..obviously the men have made a great deal of progress. M.A.D.E. is not entirely co-ed games. We do however know how hard it is to build a men’s teams, much of which has to do with common misconceptions of the sport painted by one large association. Therefore, we allow teams to compete in co-ed games as to allow their men and women equal opportunity to skate during the season. Once most teams are built up to the point where their men and women can skate separate games, they will. Billy Rae – I have to agree with you on all points. The same problem happened when your league was OSDA too. Sadly, a lot of people still don’t know there’s alternatives to WFTDA and almost 50 pages of rules! There was once a book printed, by Jerry Seltzer’s IRDL, called “A VERY SIMPLE GAME”. I don’t think anyone in WFTDA has read it. I remember Derby of old and prefer games with both sexes and alternating periods. For those who say they were all set games, I beg to differ with you. A number of games saw no set periods or “blood and thunder” jams. Also, I saw a number of legit games when Roller Bowler was skating in Philly. Ask Cindy Ogbin sometime how hard those games were!